Airconditioned Squash Courts take the sweat out of exerise even on the most humid days. The Badminton Courts at Ixora sport anti-slip wood surface for sure footing in chasing the shuttle. The spacious Billiard Room features two tables for those who love the game. 52, the Card Room, is for Bridge and Rummy fanatics. 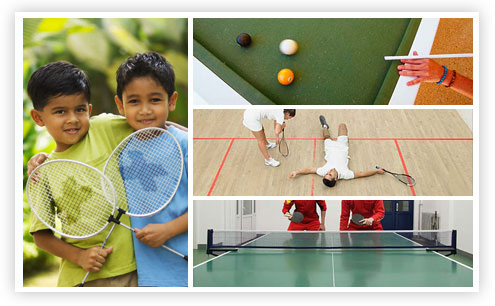 Go Bananas is what members head for to play Pool, Air Hockey and Table Tennis. Copyright © 2007 The Circle. All rights Reserved.